The most obvious, of course, would be the just-published "Welcome to FOB Haiku: War Poems from Inside the Wire." Early reader response has been overwhelming, and I am wonderfully surprised and wholly grateful. A number of reviewers have suggested that "FOB Haiku" might be a good holiday gift for veterans, but I also hope that veterans might share it with family members and friends. Maybe my small book can be a way to open conversations with others. Give the book to a friend or loved one, and then talk about it afterward. That way, your discussion doesn't have to be uncomfortably centered on you, but on the types of experiences described in the book. 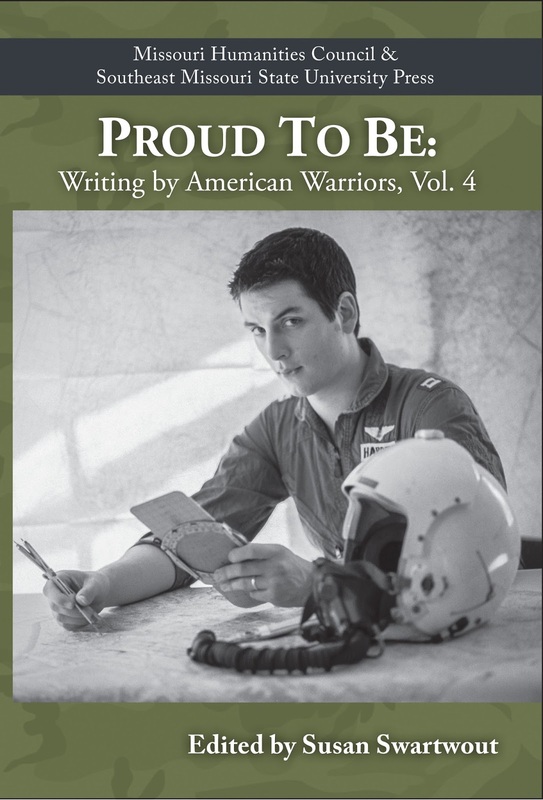 Published annually on Veterans Day, the anthology "Proud to Be: Writing by American Warriors" ($15 U.S.) is now in its fourth volume. I'm proud to have work featured in this year's volume, and prouder still to see the names of friends, colleagues, and fellow travelers. The best part of receiving this literary care package, however, is discovering new voices and perspectives in civil-military discourse. There's something here for every reader, from every branch and era, including short stories, poems, non-fiction essays, photographs, and interviews. A joint project of the Missouri Humanities Council and the Southeast Missouri State University Press, Cape Girardeau, Mo., no other book series engages the world with such precision, passion, and professionalism. 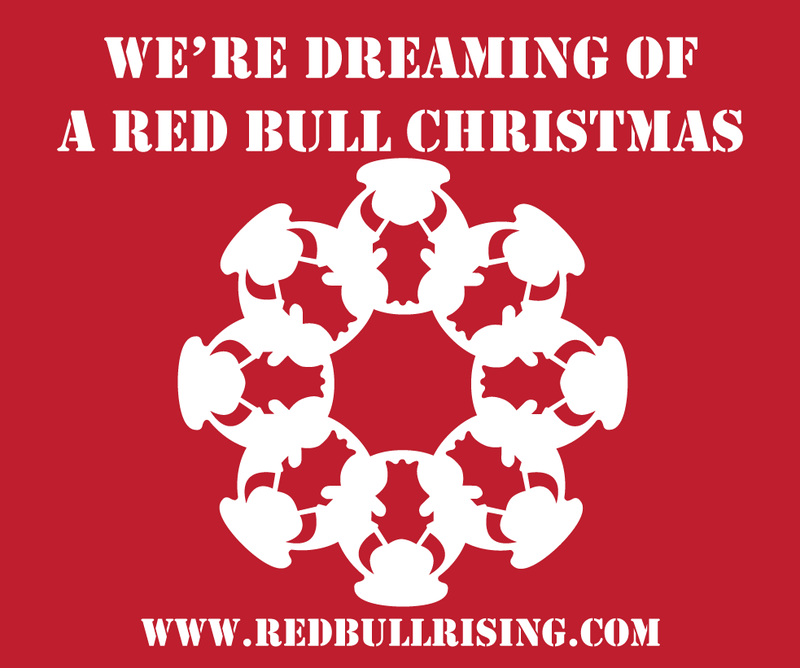 I look forward to offering a more complete review in an future Red Bull Rising post, but for now, here's the bottom line: For a great holiday gift—one certain to inspire much reflection and conversation—"Proud to Be" is a clear and present choice. 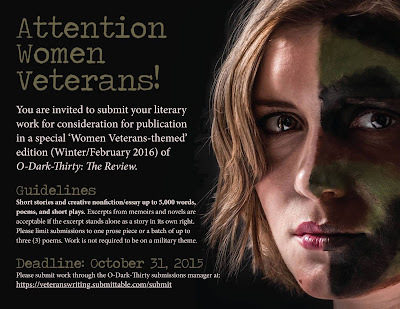 To spread such literary joy over an entire year, consider giving a $40 print subscription to the Veterans Writing Project's "O-Dark-Thirty" journal. 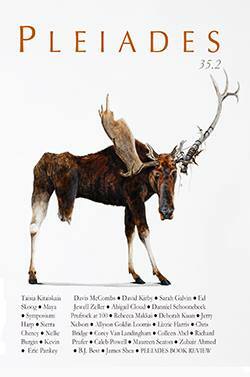 Each 80-plus-page issue delivers a curated blast of the best of current military writing. 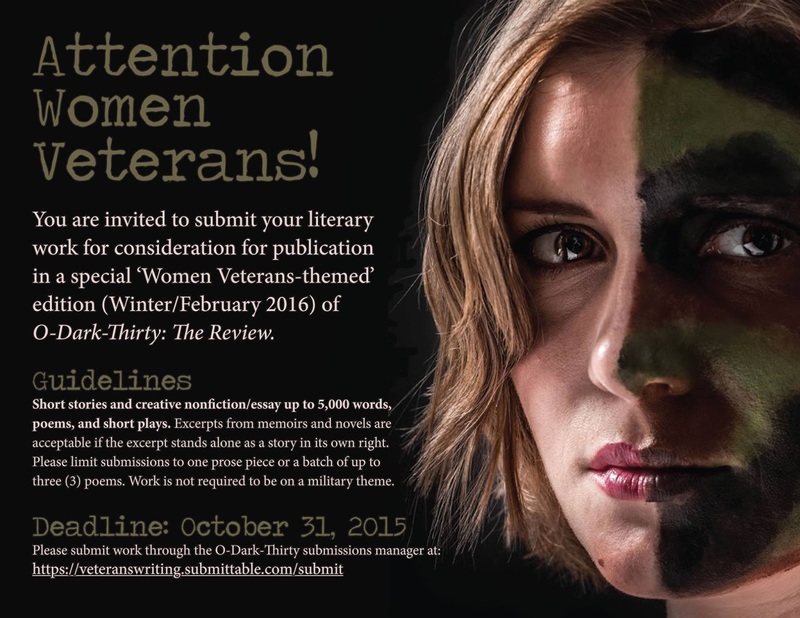 Spring 2016 will see the publication of a special issue, one focused on the stories and perspectives of women veterans. 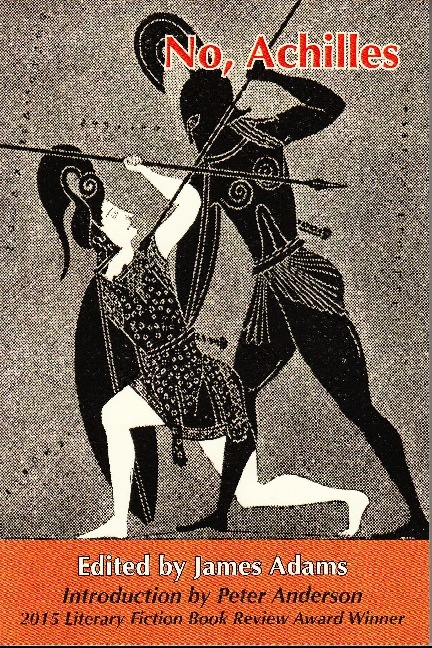 A third book newly arrived is "No, Achilles" ($15 U.S.), a 75-page collection of poetry published earlier this year by WaterWood Press, Austin, Texas. The book collects 64 poems witnessing the experiences of war. My own "night vision," inspired by 2011's "Operation Bull Whip" and other air-assault missions like it in Afghanistan, first appeared in the publication. Unfortunately for Internet-clickers like me, the book is not available on-line. Orders by check or money order to: WaterWood Press, 47 Waterwood, Huntsville, Texas 77320. Include $1 per book shipping and handling. Sherpatude No. 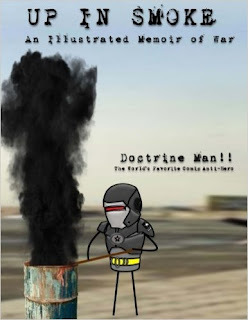 26 starts with "Humor is a combat multiplier …" And no creator delivers so regularly on that premise than DoctrineMan!!. When he isn't busy trying to draft retired U.S. Marine Gen. James Mattis (Callsign: "Chaos") to run for president in 2016, the mysterious DoctrineMan!! continues to crack wise from his undisclosed location, posting his pithy comics on Facebook and elsewhere. He, too, has recently issued a fourth print volume, this one titled "Up in Smoke: An Illustrated Memoir of War (The Further Adventures of Doctrine Man!!)" This year's cover features a tech-suited warrior pulling picket-stirring duty in some foreign land. As I like to say, "All this has happened before, and all this will happen again." And DoctrineMan!! makes me laugh, again and again. He's always (wait for it) ... stirring things up. 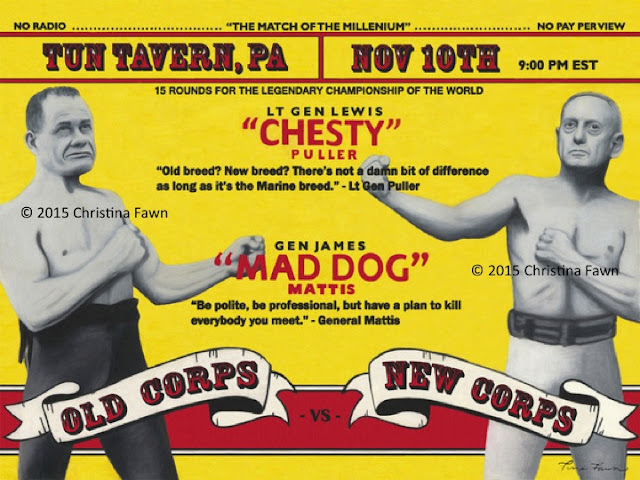 Speaking of Mattis, writer, artist, Iraq War veteran and former Marine Christina Fawn has made a "Chesty vs. Mattis" vintage boxing poster art print available for sale at her on-line store at Society6. There are a variety of sizes and formats available, including 10x8; 17x13; 21x17 inches. Available framed or unframed. The perfect gift for any Marine, whether "Old Corps" or "New Corps"! Another artist-veteran friend of Sherpa, Aaron Provost, sells a variety of artwork and (at Society6) merchandise featuring his signature black-and-white illustrations of military equipment, logos, and scenes. 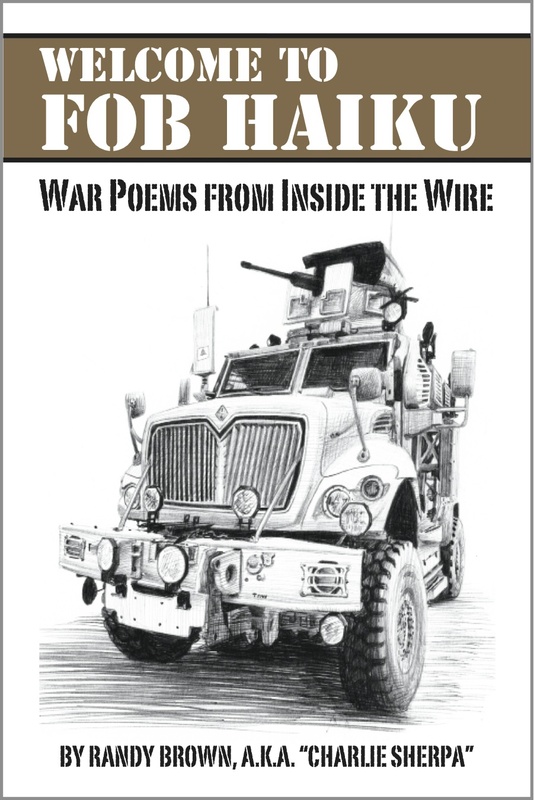 His was the pencil illustration of the Mine-Resistant, Ambush-Protected truck that now graces the cover of "Welcome to FOB Haiku." I love how his work makes you see military machinery in new ways. In his day job, Provost also works for the volcanic creative collective that is RangerUp gear and apparel. Trying to keep up with these guys is like running a 3-minute mile. There's always something new on their website. My personal favorite of their current line-up? 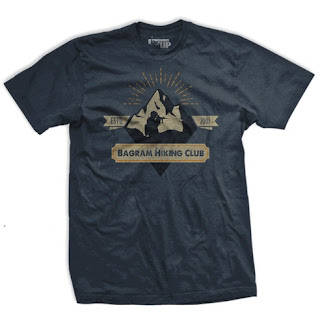 The "Bagram Hiking Club" vintage T-shirt. On the back, it reads "Tread lightly." There's a similar one for Iraq-deployment enthusiasts: "Bagdhad Summer Camp: You'll have a blast!" Be safe this (U.S.) Thanksgiving holiday! Be warm. Be responsible. Be kind to others. And "Attack!" "Every day is a holiday. Every day is a feast." Notes: A "Meal, Ready-to-Eat" (M.R.E.) 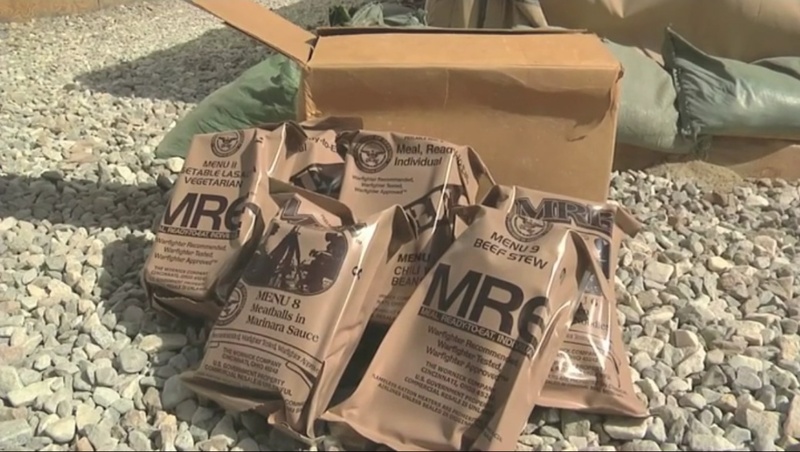 is a high-calorie field ration developed and used by the U.S. military. The inclusion of "Charms"-brand hard candies in some MRE meals was discontinued in 2007. First of all, before you call out the Poetry Samurai (they're like the Grammar Ninja, but more figurative), let me say that, yes, I'm aware of the difference between haiku and senryu. Haiku is a three-line, 5-7-5-syllable Japanese-inspired poetic form regarding a moment in nature. Senryu is similarly structured—three lines, 5-7-5—but focuses on human foibles. I write about the military. That roots me firmly in the human terrain. 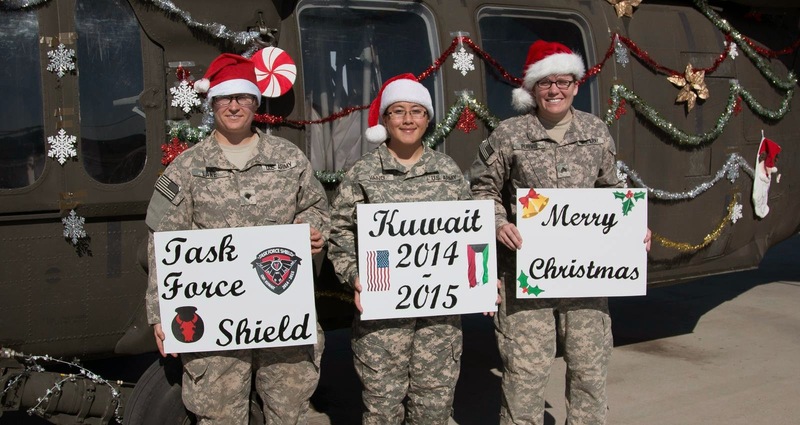 (In the U.S. Army, we brief all other forms of nature under "enemy situation.") So, technically, it would be more correct to say that I write senryu. I still call it "haiku," however, because I also know my audience. You don't need an M.F.A. to know what "haiku" is. 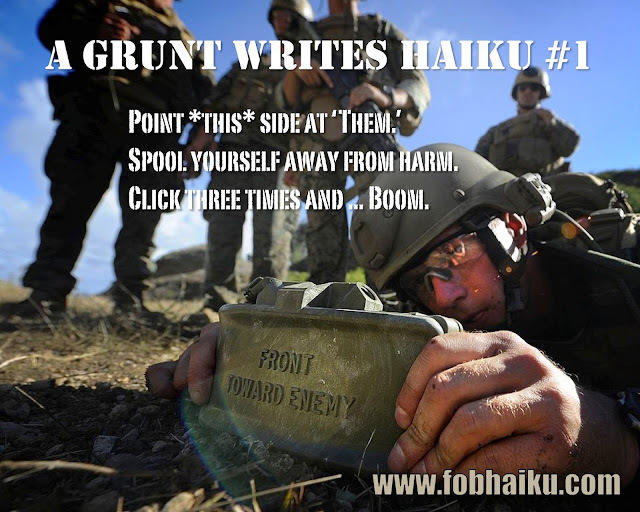 Even the @#$%ing Infantry knows haiku. Back in the day, we learned haiku in grade school. We also learned Robert Frost in junior high, and Shakespearian sonnets in high school. Fast-forward to today, and my Fifth-grade warrior-princess and Third-grade video game technician are both accomplished haiku practitioners. They also learned it in school. "All this has happened before, and all this has happened again." Because people of all ages and abilities recognize the haiku form, it makes it both accessible and (pun intended) versatile. The best haiku deliver a surprise, a shift in the action or focus. Sometimes, it can be enough to surprise readers with the fact that they just read a poem—or that they learned something in grade school that's still useful. Given the restrictions of haiku, I personally enjoy the technical challenge of finding just the right words and punctuation, to make my poetic shot-group as tight as possible. As a writer, I don't aspire to lyrical greatness—I want my language to be understandable. I want to entertain someone, and maybe get them to think about things in a different way. I write for my buddies who don't read poetry, after all—guys who sometimes barely read the instructions to complicated things. That doesn't mean they're not open to new ideas, however, or to seeing old things in new light. Point *this* side at Them. Spool yourself away from harm. Click three times and ... Boom. 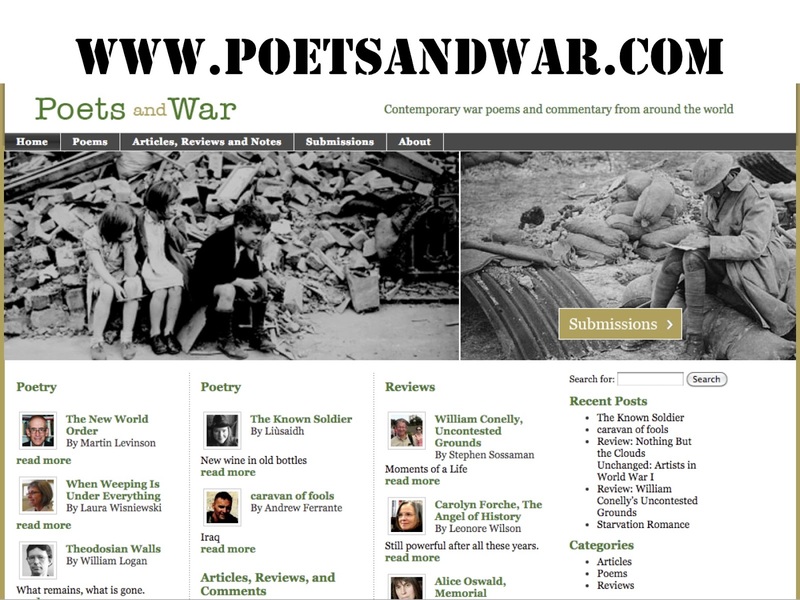 After a couple of decades away from the practice—during which I wrote daily newspaper and how-to magazine and Army lessons-learned articles—I started writing poetry again in 2011. I was at a free weekend writing workshop on the campus of the University of Iowa, run by Emma Rainey and the non-profit Writing My Way Back Home. The prompt had something to do about capturing a moment of wonder. 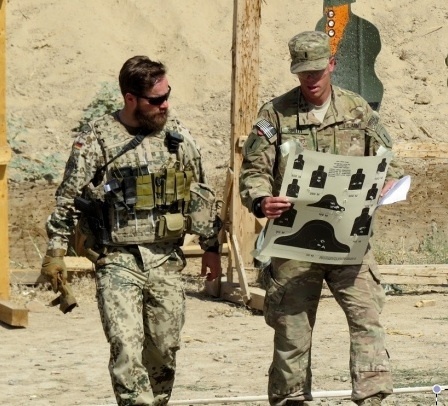 I had been stewing for months, having earlier that year embedded with my former Army colleagues deployed to Afghanistan, about an interaction I'd had with my former commander while downrange. I kept wondering what it meant. Rainey gave us a few minutes to write, mental brakes off, with some soothing music playing in the background. I started writing about my first meeting downrange with Ryder-6. Ten minutes later, I had the start of a book. I didn't realize that then, of course. It took years to admit I might be a poet. In the meantime, I still considered myself a just-the-facts non-fiction guy. Over the years, my journey was shaped and influenced by meeting many fellow travelers, such as poet Jason Poudrier ("Red Fields" ) at the first (and later, the second) Military Experience & the Arts Symposium. 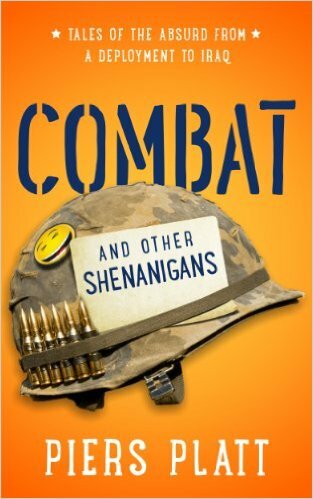 At the 2012 Sangria Summit for writers of military fiction and non-fiction, held in Denver, Colo., I learned about independent and electronic publishing as methods to overcome obstacles to market—barriers such as having too narrowly focused a niche. Little did I realize how much of that information would factor into my actions in 2015. More on that in a minute. I learned to use poetry to dig at the moments and memories that didn't quite make sense, or that didn't immediately seem to support a larger narrative. Sometimes, in my explorations, I found myself at the bottom of an intellectual hole. Sometimes, I found myself at the crest of a hill. Perhaps most importantly, I learned to accept the risks of sharing my work with others. 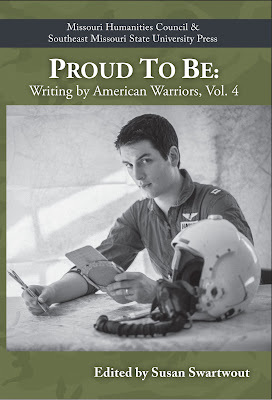 I started to get poems published in veteran-friendly venues, such as "The Pass in Review," "Line of Advance," the Veterans Writing Project's "O-Dark-Thirty," and the annual anthology series "Proud to Be: Writing by American Warriors" from Southeast Missouri State University Press, Cape Girardeau, Mo. Later, I began to get traction in non-military but Midwestern-themed outlets, such as the Kurt Vonnegut Memorial Library's "So It Goes" literary journal, and "Midwestern Gothic." Each of the above titles represents an editorial staff that is open to exploring ways to bridge the gap between civil and military experiences. We need more such bridge-builders. Earlier this year, I found I had enough poems—published and unpublished—to produce a chapbook. 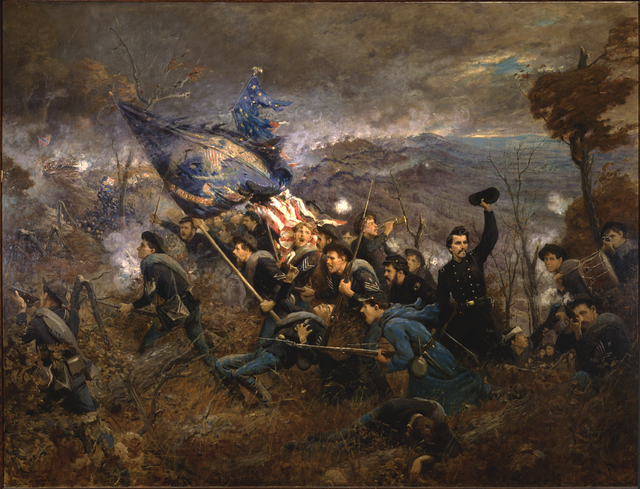 I started to submit manuscripts to chapbook contests and publishers, recognizing that "light-hearted verse about the light infantry" is more of a rabbit- than a fox-hole—a niche within a niche within a niche. (I joke that I've finally discovered a vocation that pays less than newspaper journalist—that of "military poet.") Meanwhile, I added pages. The manuscript grew to book-length. I began to realize that my poems, collected and curated, roughly reflected the narrative arc of my Army career, from Boot Camp to Bagram and back home again. The sum might be greater than its parts. Having set a personal 2015 deadline for getting at least one major writing project off my desk, I published this month via Middle West Press LLC, Johnston, Iowa. This was the same entity that had, in 2011, endorsed my freelance media credentials when I applied to embed for a few weeks in Afghanistan. The result is a 90-page trade paperback, which is also available in various e-book formats, including the Amazon Kindle, and others via Smashwords. 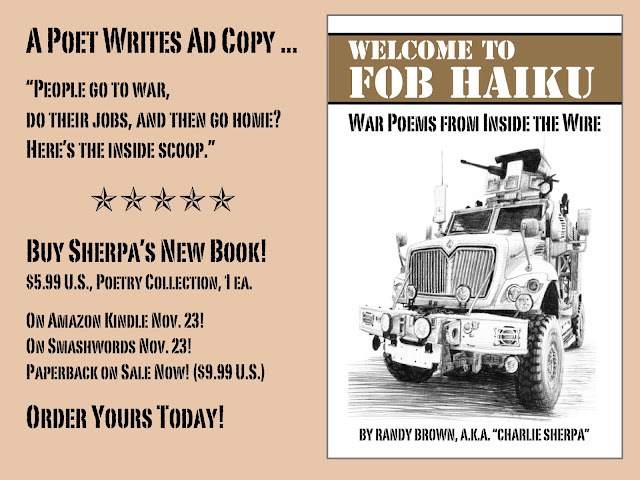 The cover design of "Welcome to FOB Haiku" mimics the hardcopy Army doctrine and technical manuals we once shlepped to the field by the truckload: Matte finish. Subdued colors. Comforting and camouflaged. Theoretically fits in a cargo pocket, just like the brigade TACSOP. The cover image is a pencil drawing by Aaron Provost, the original of which I proudly display in my undisclosed writing location. Long-time readers of the Red Bull Rising blog may remember my crush on the Mine-Resistant, Ambush-Protected ("M-RAP") trucks that epitomized so much of our country's thinking and tactics during Operation Enduring Freedom. I'm pleased to put that love on display. Even wrote a sonnet about it. I continue to write haiku, while also working on my non-fiction muscles. A couple of pals from the Military Writers Guild and I are mutually resolved to make 2016 the year of non-fiction. On the Chinese Zodiac, it's also the year of the Monkey. That seems appropriate. So stay tuned. And thanks for your continued readership. As always, I look forward to your questions, comments, insights, and now ... reader reviews? You can buy the e-book on Kindle here, or in a variety of e-book formats via Smashwords here. ($5.99 U.S.) More vendors to be listed soon! Editors at Consequence Magazine have extended the deadlines of their publication's annual fiction and poetry contests to Oct. 31, 2015. The contests opened September 1. In keeping with the annual magazine's mission, the contest guidelines read: "Entries must capture the nuances of the cultures and consequences of war; the topic is not limited to military operations, but includes social, political, cultural, and economic issues." Entries will be judged anonymously, and all will be considered for publication. Simultaneous submissions are acceptable, provided notification of acceptance elsewhere is timely and forthcoming. There is a $10 non-refundable entry fee, payable via PayPal. The fiction category is to be judged by Jesse Goolsby, author of "I'd Walk with My Friends If I Could Find Them." Send new work up to 15 double-spaced pages in length. The poetry category is to be judged by journalist and poet Tom Sleigh, author most recently of "Station Zed." Send up to three new works. 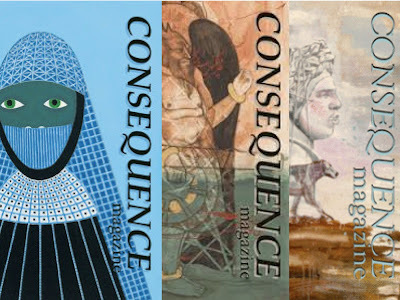 The magazine is anticipated to reopen for regular submissions starting Feb. 1, 2016. 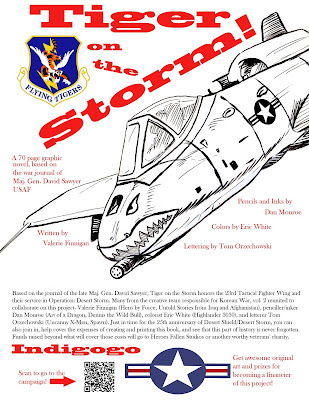 Perhaps facing similar funding odds as the beloved A-10 itself, a group of comics creators is developing a graphic novel about the U.S. Air Force's 23rd Fighter Group during Operation Desert Storm. 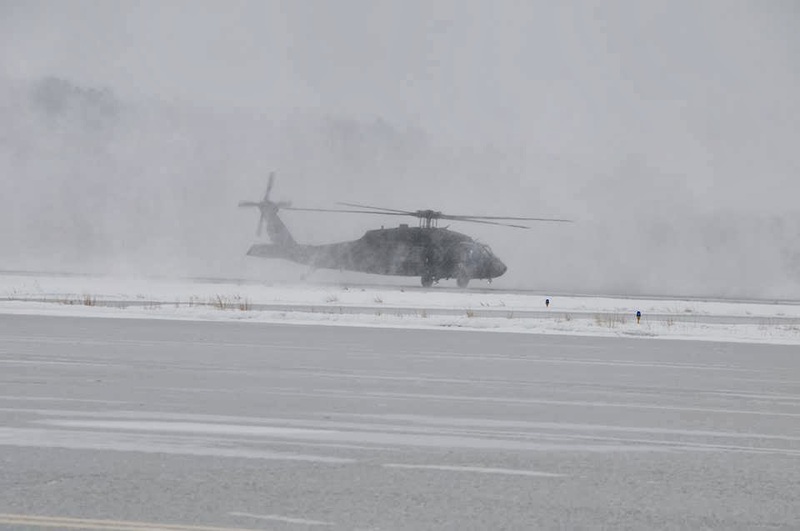 The unit continues the lineage of the famed "Flying Tigers" of World War II. Based on her work on previous war-themed projects, including "Untold Stories from Iraq and Afghanistan" and "Korean War, Vol. 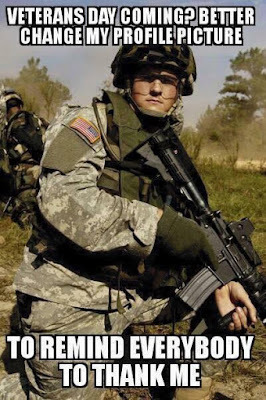 2", comics writer Valerie Finnigan was approached by the daughter of U.S. Air Force Maj. Gen. David Sawyer at the 2014 Salt Lake Comic Con regarding the project. The general was a former commander of the 23rd Fighter Group, which flies the A-10 aircraft. The A-10–formally named the "Thunderbolt II," but more commonly called some variant of "Warthog"–is specifically designed to provide troops on the ground with Close Air Support ("CAS"). The aircraft, which went into production in 1977, the low- and slow-flying aircraft notably features a titanium bathtub for pilot survivability, and a gatling cannon that delivers up to 3,900 rounds of 30mm ordnance per minute. In defense-policy circles and on the Internet, there are on-going debates whether the U.S. Air Force can continue to support ground troops using expensive, high-flying, multipurpose aircraft such as the F-35 "Lightning II." Critics argue the Air Force is actively squashing stories of the A-10's continued successes in Afghanistan and other theaters, for political reasons. 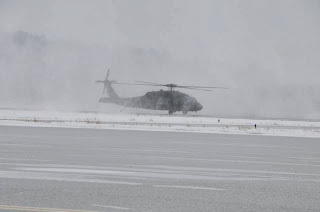 "The aircraft themselves also proved a bit of a challenge," she writes on her blog. "Appearance counts for a lot in a visual medium like comics, which is probably why A-10 Warthogs such as those flown by the 23rd [Tactical Fighter Wing] don't appear often in comics. The civilian public wouldn't line up by the hundreds or thousands to see them in an air show like they would for much prettier F-18 Hornets. While Warthogs are maneuverable enough to do their jobs, they look ugly and sound downright obnoxious." "Get to know them though, and you just may fall in love as much as anyone can with aircraft," she continues. "In talking with veterans who served on the ground as well as in the air, I learned why the Warthogs are so feared by enemy forces and strongly beloved by our troops. This is why I’m glad to have 'Korean War' penciller Dan Monroe on board doing pencils and inks. His ten years in the Army helped him learn a healthy appreciation of good close air support such as the Warthogs provide." 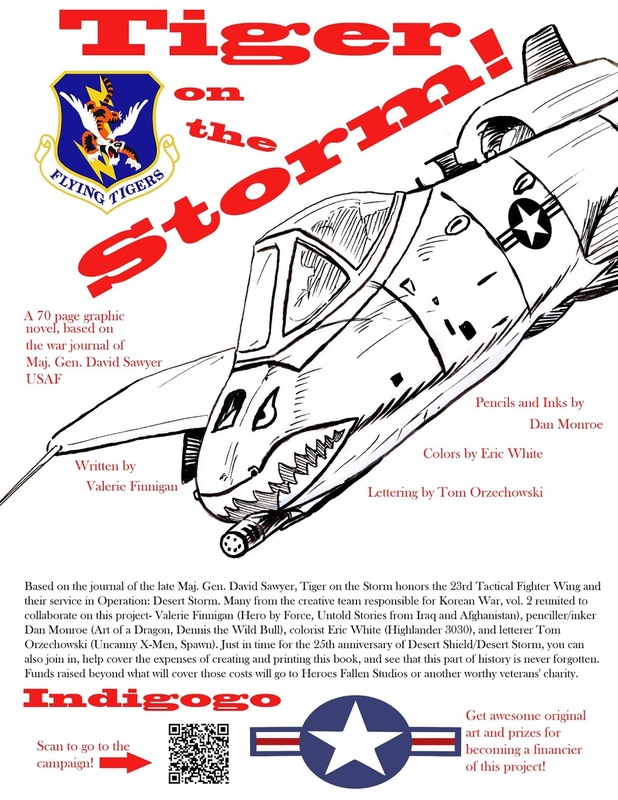 In addition to Finnigan and Monroe, "Korean War" team members Eric White (colors) and Tom Orzechowski (letters) are also potentially participating in the "Tiger on the Storm" project. Via Indiegogo, the crowd-funding effort seeks up to $50,000 to cover production, printing, and distribution costs. For more information, click here. $20K Helps Iowa Remembers Warm Up for Sept. 27 5K! 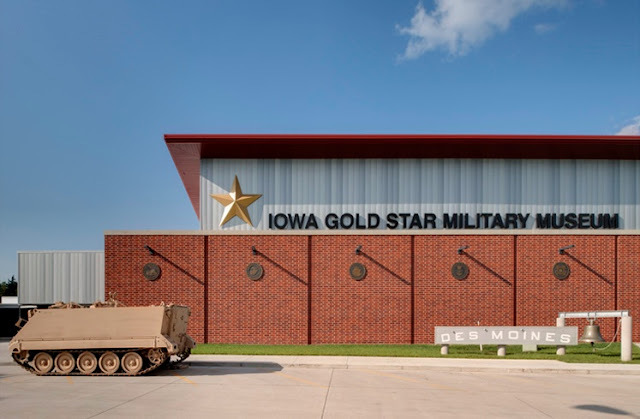 Iowa Remembers, Inc., a Des Moines-area non-profit that funds an annual retreat for surviving military families of the Global War on Terror, was a $20,000 beneficiary of fund-raising efforts at the Sept. 9-10, 2015 annual convention of Group Benefits, Ltd., Urbandale, Iowa. Iowa Remembers is best-known for its annual 5k Iowa Remembrance Run fund-raiser, which draws fields of more than 1,000 runners and walkers to West Des Moines' Raccoon River Park. The 6th Annual Iowa Remembrance Run event is Sun., Sept. 27. Race start will follow ceremonies commencing 9:45 a.m. A signature array of flags and memorials lines the path to the finish line. The public and media are invited to attend the event. Pre-race activities include a roll call of more than 100 Iowans who have lost their lives in service to their country since 2001. This year's speaker will be Mysty Stumbo, mother of U.S. Army Spc. 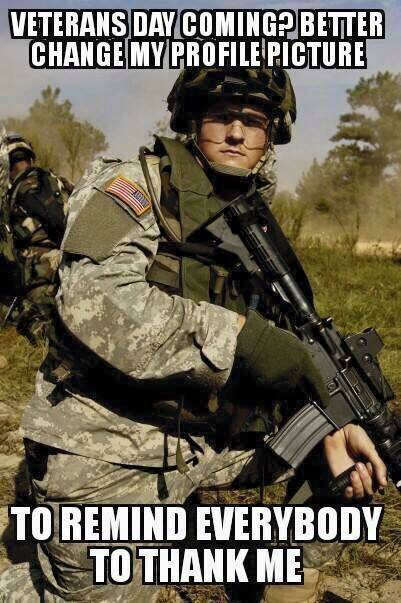 Daniel L. Sesker, who was killed in action in Iraq April 6, 2006. Registration for the run is open until Sept. 24. There is no day-of race registration. Click here to register on-line.